5cl Bottle of Vodka - triple distilled for purity this is Smirnoff at its best. Red label signifying premium vodka... perfect for a cocktail or as the Russian's do it - straight down baby! Pop it in the fridge to ensure maximum pleasure from an ice cold shot. 3 x Drumstick Lollies - raspberry & milk flavour chewy lollies. With its distinct chewy texture and dual flavour, it's no wonder these luscious lollies have been a firm favourite for generations! Retro and fun! 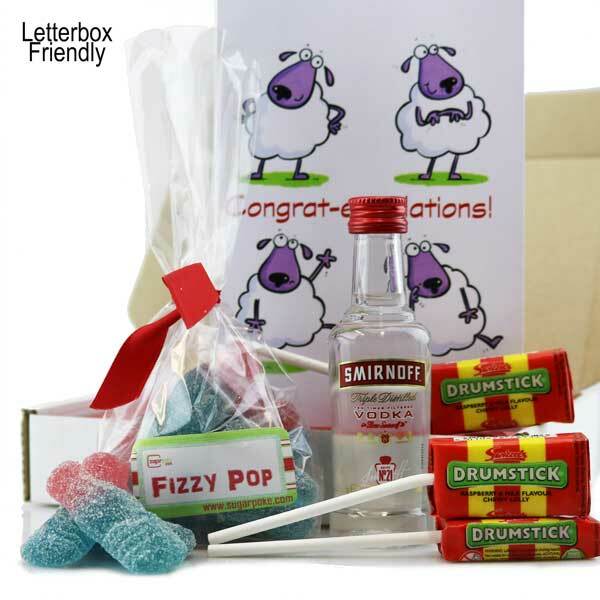 A great little treat for a birthday or something to celebrate with if they've done well!